I read on a couple of sites that March 25, 1916, marked the first time women were allowed to attend a boxing match. I find that hard to believe since women have been boxing one another since at least 1876. Whether it is true that women weren’t allowed to attend boxing matches until 1916, is immaterial to the strides that women have made in boxing over the past 100 plus years. So today GladiatHers honors female boxers. What’s more GladiatHer than two females going toe-to-toe in the ring?! Since 1876 female boxers have fought (pun intended) their way to Pay-Per-View to the Olympics and into Vogue magazine. Keep fighting ladies! Read more about women’s boxing here. 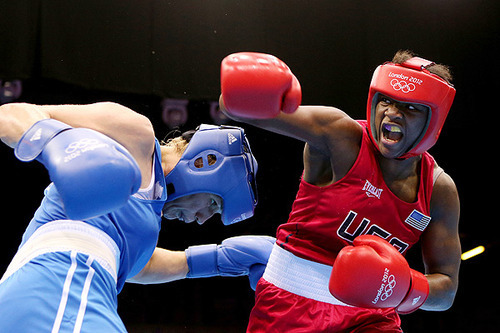 *Pictured above is Olympic gold medalist Claressa Shields.